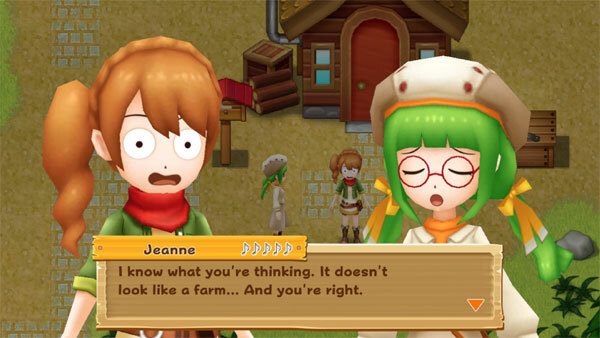 The story length of this Harvest Moon game is rather short and easy. Farmers could have the story finished by late Summer / early Fall of their first year in the game. Once the main story is complete, the game continues on and unlocks more features such as marriage, new animals, farm expansions, and new crops. You wash up on the shore of a remote island, where a strange girl with purple hair takes you to the island doctor. Once you wake up, the doctor introduces herself as Jeanne and says she found you by her front door; she doesn't know of a purple-haired girl though. Jeanne tells you the story about their derelict island and the broken lighthouse on Beacon Island that her family has been in charge of for 20 generations. Since you are interested in sticking around, she shows you to an old farm that you could live on. Jeanne also gives you a hoe, watering can, Cabbage seeds, and explains how to plant crops. If you plant all of your Cabbage seeds and want more, simply talk to Jeanne by the lighthouse to get another 10 bags of Cabbage seeds. The next morning you hear a voice calling out for help. Step outside your front door to hear a little voice tell you to pick the weed at your feet. Once you do, you'll find a weird stone tablet underneath the plant! Upon picking up the tablet you'll meet Rowan, the Harvest Sprite of crops. He thanks you for helping him with his problem. Where did that stone tablet come from anyway?! Rowan says that maybe the smart doctor, Jeanne, might know more about it. Head out from the western exit of your farm and wander over to Jeanne's house, just north of the lighthouse. Jeanne hasn't seen that particular tablet before, but she recognizes the shape as something she has seen over at the lighthouse. 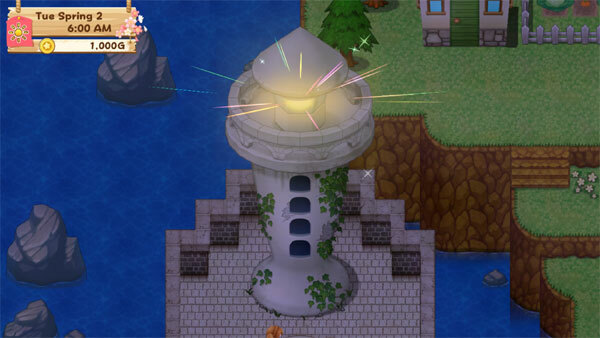 The two of you head over to the lighthouse, where Jeanne explains that there's a legend about a guardian who lives at the top of the lighthouse and shines its light over the entire island to make the island prosper. Several years ago there was a huge storm and since that time the lighthouse hasn't worked right. The residents tried to fix it until one day it just stopped lighting up all together. After that the island started changing. Jeanne looks at the panel before the lighthouse and wonders if maybe that stone tablet fits into one of the slots. Place the tablet into the upper-right location in the panel to see one of the lighthouse windows light up! While Jeanne marvels at the change to the lighthouse, Rowan appears to tell you the land and soil has been restored. Yaah! Jeanne notices that you keep talking to yourself; apparently she can't see the little Harvest Sprite. There are four more slots in the mosaic panel that look like they could fit tablets too. Maybe if you locate those tablets, you might be able to bring back the Harvest Goddess.